The Sleeping Baobab Tree by Paula Leyden, like its predecessor The Butterfly Heart, is set in Zambia. One morning twelve-year-old Fred wakes up with an unaccountable sense of foreboding, which his friend Bul-Boo, one of the twins from next door, insists is just his imagination. However, the feeling persists – and grows stronger when Fred’s scary and extremely eccentric great-granny, Nokokulu, asks him to accompany her on a trip to an ancient burial site called Ng’ombe Ilede, a place described by their teacher, Sister Leonisa, as the Place of Death. When Bul-Boo overhears her parents talking about patients going missing from her mother’s AIDS clinic, and one of the patients turns out to be Fred’s Aunt Kiki, the children suddenly view Nokokulu’s trip in a different light. Could the two events somehow be linked? As the three friends and the old woman journey into the heart of Zambia, each of them hopes to right wrongs, both past and present … but dark clouds are gathering and ancient magic is in the air. 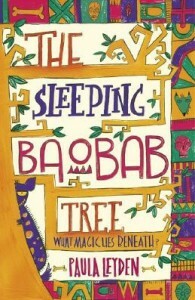 The Sleeping Baobab Tree by Paula Leyden, the sequel to The Butterfly Heart, is due to be published on May 2nd by Walker Books. Once again, a 59 page Study Guide to accompany the novel has been developed by Orla Mackey, a teacher in St. John’s School in Kilkenny. It includes chapter-by-chapter questions, web links, suggestions for writing activities, cloze activities, fact sheets, images, African songs/chants/games, wordsearch, book review and much more. Many thanks to Orla and Paula for permission to publish this Study’ Guide to coincide with the publication of the book this week.